Homeland Security Secretary Kirstjen Nielsen takes questions from reporters at the White House on Monday. She acknowledged that the Trump administration changed the way it is enforcing immigration law, resulting in separation of thousands of children from parents entering the country illegally. 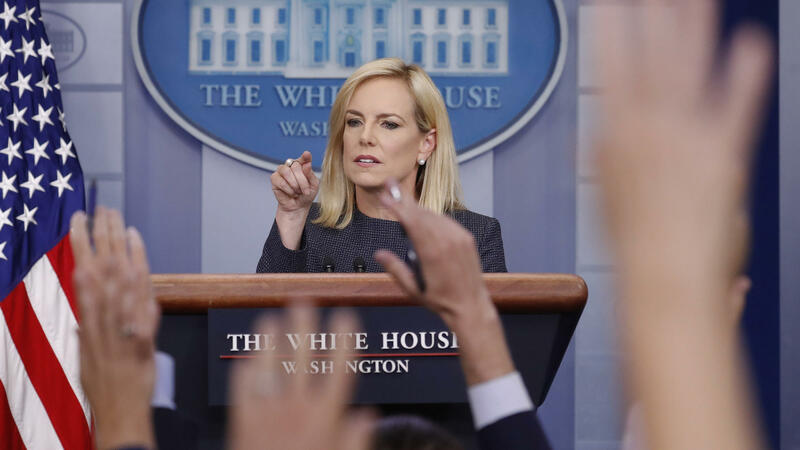 "What has changed is that we no longer exempt entire classes of people who break the law," Nielsen said at one point, even while making a contradictory claim that the administration has not changed its policy and is simply enforcing the current law. "Here is the bottom line: DHS is no longer ignoring the law," Nielsen asserted. As many fact-checkers have found, there is no such law requiring children to be separated from their parents if they illegally cross the border. And Republicans control Congress, not Democrats. As to why Trump himself won't immediately reverse the policy — which she continued to deny changed — Nielsen said that the president wants "a long-term fix." However, later in the briefing press secretary Sarah Sanders wouldn't say whether any legislation Congress may pass to rectify the situation would have to include full funding for the border wall Trump wants. Nielsen also said it was "cowardly" of Democrats to claim that children were being used as leverage for the wall. "The children are not being used as a pawn," Nielsen said, arguing that it was "smugglers and traffickers" who were using them to try to get into the country illegally. "We are trying to protect the children, which is why I'm asking Congress to act." "We are a country of compassion. We are a country of heart," she added. "We must fix the system so that those who truly need asylum can in fact receive it." And when asked if the stringent policy was being enforced to send a message of deterrence for others who may consider trying to cross the border illegally, Nielsen said she found such a suggestion "offensive." But White House chief of staff John Kelly, who previously led DHS, told NPR's John Burnett in an interview last month that family separation "would be a tough deterrent." "They're not bad people. They're coming here for a reason. And I sympathize with the reason. But the laws are the laws. But a big name of the game is deterrence," Kelly told NPR. Nielsen had previously defended the policy in a series of tweets on Sunday night; earlier in the weekend, her agency said it had separated nearly 2,000 children from adults over the course of six weeks at the U.S. Southern border. "The United States will not be a migrant camp, and it will not be a refugee holding facility," President Trump said midday on Monday, after blaming Democrats for current U.S. immigration policy. He added, "Not on my watch." "Immigration is the fault — and all of the problems that we're having — because we cannot get them to sign legislation, we cannot get them even to the negotiating table. And I say it's very strongly the Democrats' fault," Trump said. "They're obstruction. They're really obstructionist, and they are obstructing." Meanwhile, Republicans in Congress have struggled to figure out how to discuss the separation policy that many say they oppose. Several Senate Republicans pushed back on the White House policy, but most stopped short of directly criticizing Trump. Texas Sen. John Cornyn, the No. 2 Republican in the Senate, said Monday that he agrees with Nielsen that it is up to Congress to pass a long-term legislative fix to keep families together at the border. "I think that's true," Cornyn said. "The only thing the White House changed was their enforcement policy. They said we're going to enforce the law against everybody who comes into the country illegally." Cornyn was one of a number of Republicans who said the choice comes down to a decision between enforcing laws separating children from parents who are charged with crimes and ignoring those laws. Cornyn said there are other laws that require children to be taken care of separately from parents who violate laws. He said he thinks the solution should be to keep families together while they await an expedited hearing before an immigration judge. Cornyn said he plans to introduce legislation to keep children with their parents, but he would not commit to timing. But many Republicans, like Utah Sen. Orrin Hatch, disagree. Hatch was among those to denounce the policy on Twitter early in the day. He went further Monday night, telling reporters that he believes the White House can stop families from being separated and that removing children from parents is not the right way to deter people from attempting to cross the border illegally. "I think the White House can fix it if they want to," Hatch said. "I don't think there's any question about that." Hatch said a legislative fix is an option, and Congress should lead but the current situation should not be allowed to continue. "The way it's being handled right now isn't acceptable," Hatch said. "I think we've got to try and keep families together and do whatever it takes to keep them together." Sen. John McCain, R-Ariz., who was the 2008 GOP nominee for president, tweeted his disgust with the current policy, calling it "an affront to the decency of the American people" and saying the Trump administration should rescind it immediately. Sen. Lisa Murkowski, R-Alaska, also said Monday night on Twitter that "The time is now for the White House to end the cruel, tragic separations of families. ... To blame the previous administrations for a wrong committed today is not acceptable. The Attorney General and Secretary of Homeland Security should make the call today." Democrats were forceful in pushing back at the administration's claims, with several, including Sens. Kamala Harris of California and Mazie Hirono of Hawaii, calling on Nielsen to resign. Nevertheless, throughout the day on Monday, Nielsen and Attorney General Jeff Sessions defended the president's policy of splitting children from the adults who brought them into the U.S.
"We do not want to separate children from their parents, you can be sure of that," Sessions said. "If we build the wall, we pass some legislation, we close some loopholes, we won't face these terrible choices." Nielsen said the separations are warranted in cases where the parents have broken U.S. law by entering the country illegally — and that her agency is treating them no differently from the way the government treats parents who break any other laws. But the Trump administration is being accused of handling the cases in a way no other presidency has. "This zero-tolerance policy is cruel. It is immoral. And it breaks my heart," former first lady Laura Bush said in remarks published Sunday night. Bush wrote an opinion piece for The Washington Post in which she compared the DHS actions to the U.S. policy of incarcerating Japanese-Americans in camps during World War II. First lady Melania Trump also weighed in over the weekend, with her communications director, Stephanie Grisham, sending a statement to CNN. "Mrs. Trump hates to see children separated from their families and hopes both sides of the aisle can finally come together to achieve successful immigration reform," the statement read, concluding, "She believes we need to be a country that follows all laws, but also a country that governs with heart." The DHS policy triggered a lawsuit in February; nearly a year earlier, members of the Trump administration had floated the idea of separating families as a potential deterrent. A number of high-profile Trump officials have spoken in favor of the policy. Last month, Sessions said, "If you don't want your child to be separated, then don't bring them across the border illegally. It's not our fault that somebody does that." Sessions spoke on Monday at the National Sheriffs' Association conference in New Orleans, where he received a lifetime achievement award. In his speech, the attorney general said the U.S. is having "an important conversation" over whether it will be "a country of laws" or "a country without borders." One reason people voted for President Trump was "to end the lawlessness at our Southern border," Sessions said, adding, "It's within our grasp. We can do it." Sessions said that a loophole in U.S. policy had encouraged people to bring children to the U.S., under the belief that they would not be prosecuted. That resulted in a spike in illegal crossings, he said. "We do not want to separate children from their parents," Sessions said. "We do not want adults to bring children into this country unlawfully, either, placing those children at risk." Nielsen also spoke at the conference, before returning to Washington where she spoke to reporters at the delayed White House briefing. Describing how the DHS and Health and Human Services agencies handle those children, Sessions said, "They're not put in jail, of course — they're taken care of. They remain in the country, even though they don't have a lawful process to be here." Sessions added, "That's an enormous cost that's being incurred by our government." The backlash against the Trump administration's tactic grew into a protest march on Sunday, with hundreds of people heading to a tent city in the town of Tornillo, near El Paso, Texas, where children have been detained. The Father's Day march was organized by Rep. Beto O'Rourke, D-Texas, who is challenging Republican Sen. Ted Cruz for his seat. Cruz introduced a bill to prohibit family separations on Monday. Overall, more than 10,000 children are currently in shelters run by the Office of Refugee Resettlement, which is part of the Department of Health and Human Services. U.S. Customs and Border Protection has published a guide for families who have been separated after parents or guardians were charged with illegal entry, noting that children who are taken into government custody are transferred to the Office of Refugee Resettlement, "where your child will be held in a temporary child shelter or hosted by a foster family." The guide sheet adds, "DHS and HHS can take steps to facilitate reunification with your child(ren)." Last month, Nielsen told NPR that her agency is merely enforcing existing laws, and that criticism of the zero tolerance policy "is inappropriate and unacceptable." That has not stopped what has now become a wave of criticism for the DHS policy of applying the law. Religious leaders are speaking out against the policy, with Archbishop of Miami Thomas Wenski saying on NPR's Weekend Edition that the practice effectively "weaponizes" children. Franklin Graham, son of the late evangelist Billy Graham and a prominent Trump supporter, told the Christian Broadcasting Network on Tuesday, "It's disgraceful and it's terrible to see families ripped apart, and I don't support that one bit." In her tweets Sunday night, Nielsen accused others of distorting reality, saying, "This misreporting by Members, press & advocacy groups must stop." The DHS secretary added, "if you are seeking asylum for your family, there is no reason to break the law and illegally cross between ports of entry." The Obama administration also came under fire for its immigration and detention policies, with lawsuits over the practice of holding families in detention centers as well as the conditions at such facilities. By embracing a more hard-line policy, the Trump administration has set off speculation that it's using the threat of separating families as both a deterrent to immigrants and a political tool in the hopes of reshaping U.S. laws. "You have many people in the Trump administration denying that they're using this as some sort of political leverage," NPR's Scott Detrow reports. "But President Trump is leaning into that pretty hard." On Sunday, Trump tweeted, "The Democrats should get together with their Republican counterparts and work something out on Border Security & Safety. Don't wait until after the election because you are going to lose!" On Monday, the president added, "Why don't the Democrats give us the votes to fix the world's worst immigration laws?" In Congress, House Republicans have introduced a bill to end the practice of separating families, but it would also require Democrats to agree to federal funds for a border wall. As that argument plays out, others are urging a new attempt to address the root causes of mass migration from people who want to flee troubled or impoverished conditions in countries such as El Salvador and Honduras. "There's different elements of the government that don't understand what's really going on. Kids are being separated from their parents. In the last two months, there's been about 2,000. The previous year, it was almost 700. And 100 of those kids were under the age of 4." Hurd added, "This is just absolutely unacceptable. Taking kids from their mothers is not preventing terrorists or drugs from coming into this country. And so why we would even think that this is a tool that is needed to defend our borders is insane to me." NPR's Danny Nett and Kelsey Snell contributed to this report.